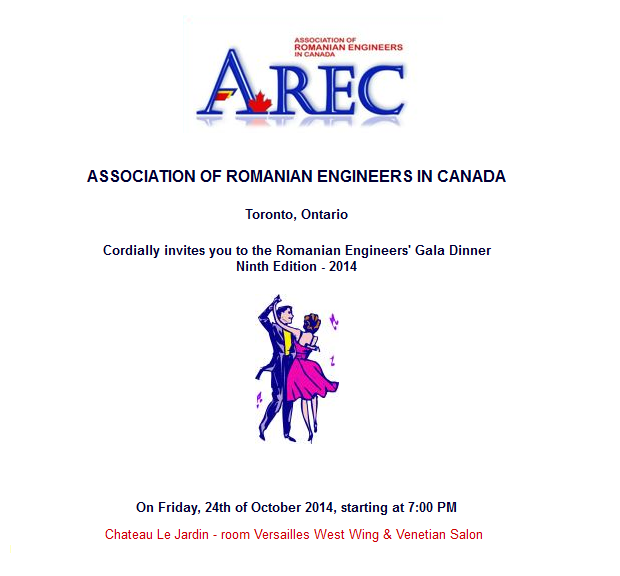 The Association Of Romanian Engineers in Canada (AREC) Cordially invites you to the Ninth Edition of the Romanian Engineers’ Gala Dinner on October 24, 2014. All tickets must be purchased in advance. We are not accepting payments at the event. The AREC Dinner Gala Committee gratefully accepts donations from individuals and corporations. The donors will be acknowledged in the Gala’s programme and can present their materials at the entrance in the hall, will have 1 year website banner on AREC’s website, as well will be promoted at AREC’s annual events. Donations Benefactor $500 or more. Includes two tickets to the Gala, will be promoted at AREC’s annual events, 1 year website banner on AREC’s website and in the AREC’s newsletter and one year AREC membership. Patron $300. Includes one ticket to the Gala, will be promoted at AREC’s annual events and 1 year banner on AREC’s website. Supporter $200. Includes one year AREC membership and will be promoted at AREC’s annual events. Come to celebrate your professional success in this year and set yourself up for more success in the next years by networking and having fun with your friends! Let’s celebrate and have fun together!